Garland programs at the Paley have varied in types of content — from bits and pieces of a number of television appearances across a series, or Garland segments from a longer talk show or variety show, or extended full show experiences. What remains potent is the power of the small screen image projected large, enabling the perusal of familiar small format images in a new way. 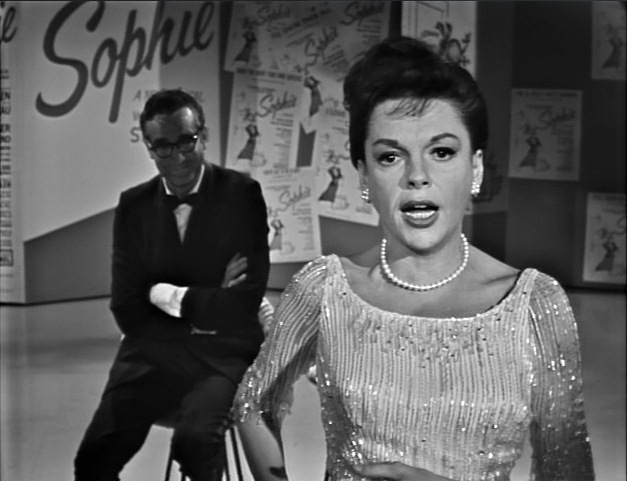 The program for today’s musings includes two full experiences included in a single Paley program — an edited version of a December 1964 concert as broadcast edited on British television, and a full episode of the 1963-64 television series The Judy Garland Show recorded in October 1963 and broadcast in January 1964. Both of these programs are among those I have loved for some time. 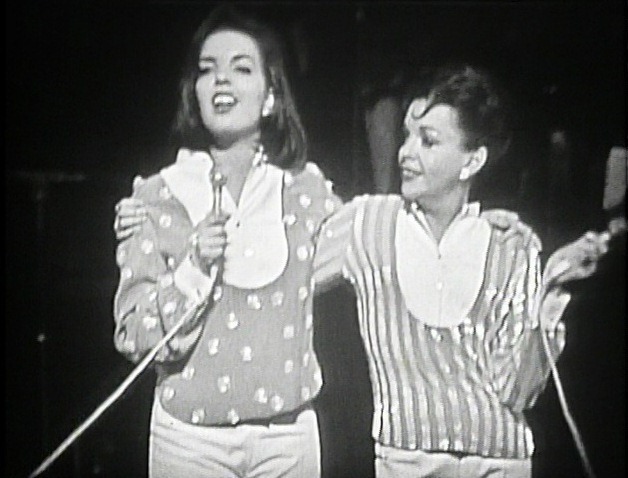 One is a record of Judy and daughter Liza Minnelli (truncated as it was at the time, editing over 2 hours of performance to a 55 minute television slot) at a particular time in both their careers as performers and at a particular moment (stage version at least) in their relationship as mother and daughter. The second is a record of Judy at a point of her television show in delectable exchange with a beloved friend and brilliant colleague Steve Allen, who she honors by singing the stuffing out of a number of his tunes. We’ll ramble through a few details of the performances then pause for a while to ponder the power of the Garland gaze. Those gazing upon her, those upon whom she gazes. In performance. Delectable. Friday August 5 Judy and Liza at the Palladium (the 2nd of two concerts, recorded December 20, 1964 and edited for broadcast on British television) is up first. Judy at 42, Liza at 18, both absolutely at home on a stage, December 1964. I marvel again at the sequence of wonders in this edited performance — Garland alone, then Liza alone, then the women together, and for the balance of the show bouncing between solo and duo spots. It works because of their charm, it works because of the set list. And I contend, it mesmerizes because of the Garland Gaze. Garland on the lip of the Palladium stage. “The Music That Makes Me Dance” indeed. Garland performs “Music That Makes Me Dance”, the boffo ballad from the original stage production of Funny Girl, seated (until the final notes) cross-legged on the stage. I have loved this tune since embracing the original cast recording. Much like the boffo ballad from Cy Coleman’s City of Angels “With Every Breath I Take”, “Music” is too infrequently (or inadequately) performed. These tunes are difficult emotionally and melodically yet so darn rewarding in the voice and talents of the right performer. Yes she is one of those “right” people. Here Garland interacts directly with her audience with a palpable intimacy. Liza. Judy. The gaze in anticipation. Soon thereafter, daughter Liza is welcomed to the stage with hugs, smiles, and an upward gaze. “Hello, Liza” and “Hello Momma” and we’re off to a new series of experiences with the intensity of the gaze. Sussing out, checking the details, embracing physically and vocally. Liza performing “Who’s Sorry Now”. Judy beaming. And we come to the sequence that melts my heart. Delightfully gawky Liza sits almost motionless on a stool for much of her solo performance of “Who’s Sorry Now”. What she has that most performers couldn’t hope to have is Judy Garland at her feet (at whom Liza barely glances once she is into her performance), sitting quietly, watching, then gradually loosening and opening and verbalizing her enthusiasm as Liza herself loosens and opens her performance. This is a performer learning the ropes. This is a performer supporting, adoring, appreciating from below. Enchantment in the gaze. The second portion of the Paley program was recorded about a year before the Palladium performance. Back in California, Judy hosts her good friend and brilliant performer and writer Steve Allen. Episode 11 of The Judy Garland Show is recorded on October 18, 1963 and broadcast January 5, 1964. 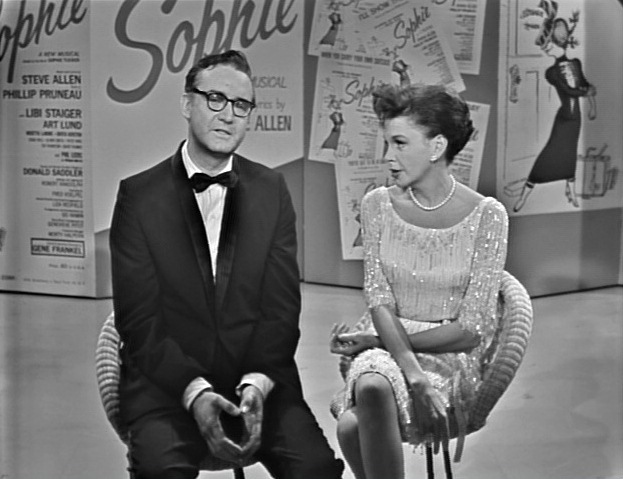 Judy and Steve and Mel Torme cut up and joke throughout the show, and for my money this episode contains the most palatable performances of musical director/consultant Torme on the show — old high school friend Steve Allen seems to keep Mel’s personality in line. “I’ll Show Them All”. Steve explains the tune. Judy prepares. The eternal Garland Gaze moments come for me during a medley performance between Judy and Steve containing songs from his short-lived Broadway show Sophie, about the life of Sophie Tucker. This sequence has always enchanted me for the easy rapport, my introduction to a number of tunes, the whole megillah. Steve’s delighted gaze on Judy. Judy showing them all. Once the reins are handed to Garland, she begins telling the tale. Of the small and large acts of bravery we engage in almost every day to stand in our own strength and show the world what we’re made of. “I’ll show them every one”, Judy sings in the tune. My face hurts from smiling at both the power of this performance and friend Steve Allen’s appreciation of Garland’s performance of his work. Imagine that experience. And here we are.